The equity benchmark indices ended a volatile session in the negative territory on Monday as investors awaited cues from March-quarter results starting this week. Besides, sell-off in oil sector and profit-booking in recent gainers also led to the decline in the market. 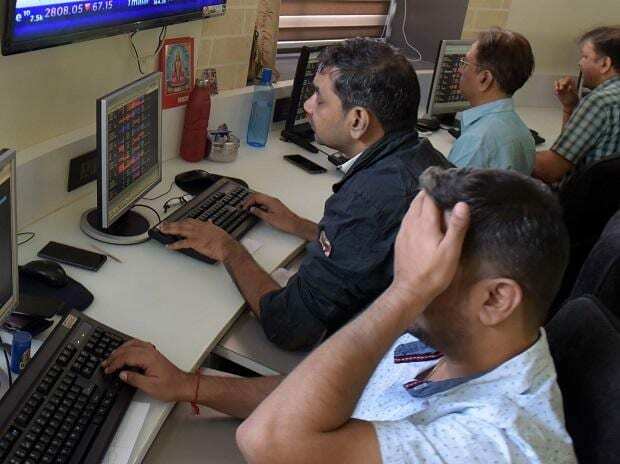 The S&P BSE Sensex shed 162 points or 0.42 per cent to close the day at 38,701 with Bajaj Finance being biggest loser and Infosys the top gainer. Out of 30 components of the index, 21 scrips ended in the red and rest nine in the green. In the broader market, the S&P BSE MidCap fell 111 points or 0.72 per cent to end at 15,398 while the S&P BSE SmallCap index ended at 14,987, down 59 points or 0.39 per cent. Volatility index India VIX jumped over 9 per cent to end at 20.10, indicating a sharp jump in volatility in the market. The broader Nifty50 index of the National Stock Exchange (NSE) closed below the 11,650 level to settle at 11,604.50, down 61 points or 0.53 per cent. All the sectoral indices on NSE barring IT ended in the red. Realty stocks bled the most, followed by PSU bank and media counters. The Nifty Realty index slipped 2 per cent to end at 270. On the other hand, the Nifty IT index ended at 16,028, up 105 points or 0.66 per cent. NIIT shares surged 20 per cent to Rs 114.50 on the BSE in the intra-day trade after a funds affiliated with Baring Private Equity Asia (BPEA) said that it will buy the company's and promoter entities' 30 per cent stake in NIIT Technologies for about Rs 2,627 crore. The stock ended at Rs 114, up 19 per cent. Shares of Lakshmi Vilas Bank (LVB) were locked in the upper circuit for the third straight trading days after rising 5 per cent to Rs 97.35 on the BSE on Monday after the private sector lender announced merger with non-banking finance company Indiabulls Housing Finance (IHF). Gujarat Gas shares rallied 9 per cent to Rs 168 in intra-day trade on the BSE on Monday, surging 15 per cent in the past three trading days, after the company announced that it has received a grant of authorization for city gas distribution networks. Shares, eventually, ended at Rs 157, 2.05 per cent. On the other hand, shares of oil and gas companies fell in the trade. OMCs such as HPCL, BPCL, and IOC slipped up to 4 per cent on BSE. Asian shares briefly brushed seven-month peaks on Monday as investors cheered a rebound in US payrolls and hints of more stimulus in China, but caution soon surfaced ahead of what is likely to be a tough US earnings season. MSCI’s broadest index of Asia-Pacific shares outside Japan went flat having reached its highest since August. Japan’s Nikkei was off 0.1 per cent after reaching its high of the year so far. E-Mini futures for the S&P 500 eased 0.2 per cent and futures pointed to a soft start for the major European bourses.